Nowadays shopping mall in Tangerang Selatan has become a necessity, because Tangerang Selatan is one of the prominent satellite cities of Jakarta. Many people live here and commute to Jakarta everyday. Address: Jalan BSD Raya Utama, South Tangerang. 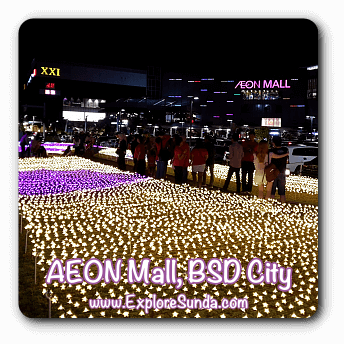 We start our trip with AEON Mall at BSD (Bumi Serpong Damai) City. It was opened in June 2015. Since then it is the most crowded mall in Tangerang Selatan, especially during weekends. Many restaurants and food stalls occupy the ground floor and third floor. It has 2 food courts: the Japanese food court on the ground floor and the Indonesian food court on the third floor. The tenants of this shopping mall are various, from Uniqlo fashion store to book store such as Gramedia and Books and Beyond, from JYSK (the household goods store) to Cinema XXI, from Celebrity Fitness to gadget stores such as Erafone and Fujifilm Digital Imaging, from hair salon to travel bureau, not to mention many smaller shops scattered all over the mall. So, it really caters to the whole family needs. Magic Fountain. It is an open area with many lights and water holes. The fountain, lights and music plays every hour starting 12pm on weekends and 5pm on weekdays. Usually many children wait impatiently around the fountain. As soon as the fountain is on, they run excitedly and have fun playing water in the middle of the fountain! Sakura Illumination Park, the outdoor garden on the front lawn of AEON Mall. When the dusk is approaching, the garden starts to lit up with lots and lots of lights. It is visitors’ favorite place to take pictures :) We can enjoy it from 6pm until 10pm. Address: Jalan BSD Grand Boulevard Raya no. 1, BSD City, South Tangerang. Closed to AEON Mall is a new convention center named ICE - International Convention Exhibition. Many events held here, from trades such as auto show and pet exhibition to performances such as ice skating show and concerts. Address: Jalan Grand Boulevard, BSD Green Office Park, South Tangerang. The concept of The Breeze is a mall without walls, hence, most of the tenants occupy small buildings, all of them are connected with pergola and gardens. There are various tenants here, such as cinema, supermarket, fitness center, billiard and bowling alley, but many are restaurants, which really fits as an open air lifestyle mall. Then there is a big pond at one side of the area, where several ducks, geese and swans live. There are several drawbacks of having too much open air though. First, it's obvious that it is difficult to walk across this mall during the rain. Second, it's too bad that people tend to smoke whenever in the outdoor, which is supposedly forbidden in this area. As one of the biggest book retailers in Indonesia, Gramedia group will spoil book lovers with the opening of Gramedia World Building in BSD City. The top level of this building is completely dedicated for books, so we will find thousands of books here. Exploring Gramedia World BSD City is like walking through any other Gramedia stores in other shopping malls, but the volume of the goods are more than triple. Thus, we will find stationaries, toys, school bags, backpacks, camping gears, and fancy stuffs among things sold here. Address: Jalan Boulevard Gading Serpong, South Tangerang. Located in the heart of Gading Serpong residences (consists of Summarecon and Paramount Serpong), Summarecon Mall Serpong (SMS) has a huge visitors everyday especially during weekends. It’s because we can go shopping from clothing to household items, stationery, books and electronic gadgets, then we can choose from Indonesian to western or Chinese cuisine, and we can entertain ourselves in the cinema or in the game centers: Timezone and Lollipop Playland. The main tenants of SMS are Star department store, Centro department store, Best Denky, Paperclip, and Gramedia. We also can go shopping in the many smaller specialty shops and boutiques. We can indulge ourselves with delicious treats in the many restaurants and cafes. They are either in the outdoor called Downtown Walk, or indoor in ground floor and in the second floor. If you come with a group of friends with different tastes, you may find the food court called Food Temptation is more suitable, since you can order many different foods and dine together. The Downtown Walk has 2 stages for performances, such as band and school concert during weekends and holidays. The cafes and restaurant here open until late at night, or should I say early in the morning? ;-) especially on Saturday nights. Another perk in SMS is going to a cinema. Not only an ordinary cinemas, but it has an IMAX, where we can watch 3D movies. Address: Jalan Scientia Boulevard, South Tangerang. SDC is the latest shopping mall from Summarecon group in Tangerang Selatan. As the name implies, it focuses on selling digital gadgets, such as computers, laptop, tablet and smartphones. Since it is relatively new, some of the spaces are still empty. There is a small foodcourt in the upper floor, or we can dine in at some restaurants facing the open space where there are two outdoor stages. Adjacent to SDC is a park called Scientia Square Park. It is an outdoor playground and park. We can rent inline skates, and skate board. Or we can try to do wall climbing. We can see rice field including the water buffalo, corn field, fish ponds and butterfly park. We can feed rabbits and fish. There are tracks for remote control cars, both for the off road truck and racing cars. Overall, it’s refreshing to have an outdoor space where the whole family can enjoy playing together.